Proven Hino technology means that your vehicle will perform reliably no matter how tough the haul. The solid, heavy-duty exterior is the shell for a powerful engine that pumps out up to 2157Nm of torque; while the Hino 700 engine itself is energy efficient. Reducing running costs through common rail diesel technology, while still delivering great fuel economy and lower carbon emissions. 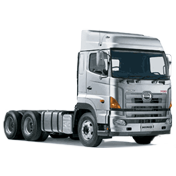 Download the latest Hino 700 brochure with the vehicle specifications below.